Many years ago, when my teens ruled the roost and life was the easiest that it has ever been, my usual day started with attending a few lectures at college or not! followed by an hour at our accountancy coaching class and the rest of the day was fun and free, I spent many an afternoon sitting on my bed eating a bowl of instant noodles and watching BBC on the tele. I loved watching their comedies and travel shows that gave a beautiful picture of the life and times of the people in the western world. One such afternoon as I was doing what I usually did, I came upon a programme that showed Germany in all its countryside glory. The half hour segment was divided into two. First the famous cuckoo clock of Germany and a tour of its factory and the second, an authentic Black Forest Cake recipe, a signature German dessert. The series showed a lady who baked, filled and decorated a Black forest Cake from scratch. It was here that for the first time ever I realised that traditionally Black Forest Cake layers are always brushed with a mix of simple syrup and Schwarzwälder Kirsch(wasser) a specialty liquor of that region, that is distilled from tart cherries. This is the ingredient, with its distinctive cherry pit flavor and alcoholic content, that gives the dessert its flavor. The dessert is named not directly after the Black Forest (Schwarzwald) mountain range in southwestern Germany but rather from the liquor Schwarzwälder Kirsch(wasser). Cut to present day, when I set off to make my own "authentic" BF cake a search for this very liquor, its cousin Cherry Brandy or for that matter even cherry flavoured essence returned unfulfilled. No where in India could I find any of the above. Last month at I was selecting ripe juicy mangoes at the local farmers market a sudden thought flashed in my mind, it would be June next month that would mean it would be cherry season, how about making some kind of cherry flavoured alkahul of my own? A quick search yeilded a few results for homemade cherry brandy, cherry liquor and cherry vodka. Now since locally available brandy's gets me down with acidity and the recipes for liquor had loads of sugar combined with a two months standing period, I zeroed in on making some cherry Vodka. You know what recipe to watch out for in the coming months here on the blog dont you? 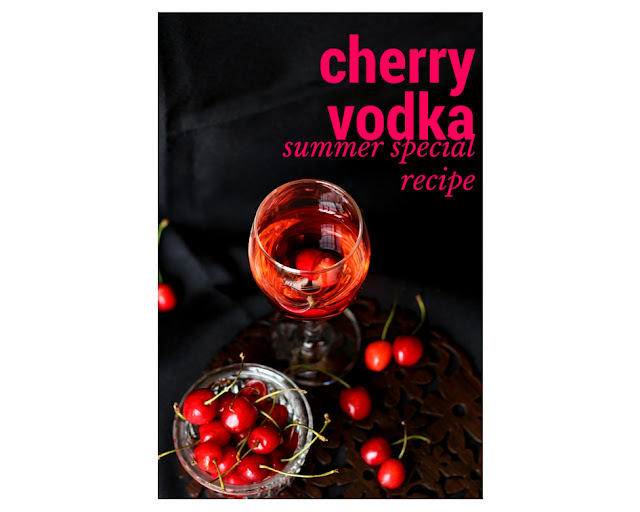 Until then checkout this two ingredient cherry vodka recipe. Its great on a particularly rainy night over a cube of ice and a splash of Sprite. Throughly wash and dry all the cherries. Tumble in all the cherries into a glass jar with a lid. Pour over the vodka till all the cherries are submerged and an inch more. Cover the lid and store in a dark, cool and dry place. Remove the jar after two weeks, strain the vodka and transfer into a clean glass bottle.